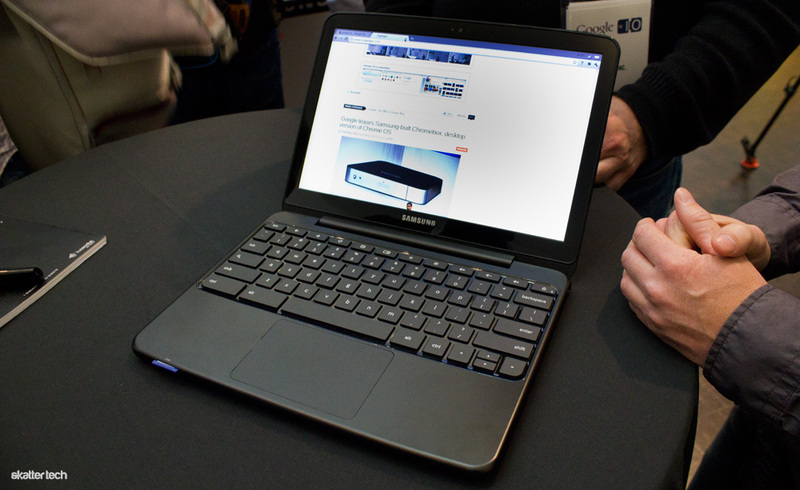 Last week at I/O 2011, Google announced a new product line of Chromebook laptops. This comes a little over 6 months after the company began handing out over 60,000 CR-48 Chrome Notebooks to businesses, developers, and students. Unlike a traditional operating system, Chrome OS is all about the cloud. Despite internal hard disk space, users actually access files and work through a browser on the web. Google will offer an over-the-counter consumer version for a one-time fee in addition to paid monthly subscriptions which provide technical support and hardware upgrades for education and business customers. Acer and Samsung are initial hardware partners for this “new kind of computer” as Google describes, but I think there are some concerns worth addressing. For those not familiar with Chrome OS, there is not much you need to know. Imagine a computer with the Google Chrome browser, but nothing else. There is no desktop with icons for applications, a fancy dock for programs, or even a start button. The entire interface consists of full screen tabbed web pages and users can create multiple windows to group these as well. It is simple enough, but it is also a problem. The current state of the operating system did not even have a file browser and the was almost entirely useless when in areas without mobile broadband or WiFi such as an airplane. Google is fortunately addressing those concerns with and more with a major update. The original Chrome Notebook shipped without any branding. There was no mention of Google, Chrome OS, and hardware manufacturers on the chassis. The production models are quite different. Acer and Samsung both proudly tout their branding along with a Chrome logo too. Unlike netbooks, these Chromebooks sport a full-sized keyboard and a large multi-touch trackpad. The operating system boots up from a full shut down in under 10 seconds and resuming from standby is instant. 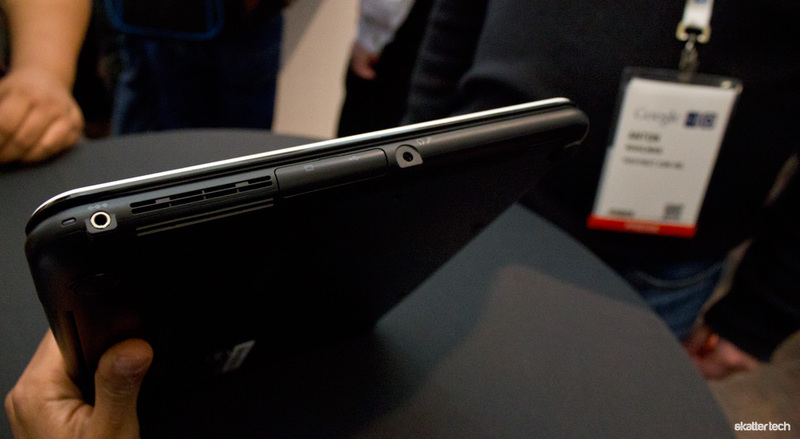 These laptops also come in two varieties: WiFi-only and a world-mode 3G model. 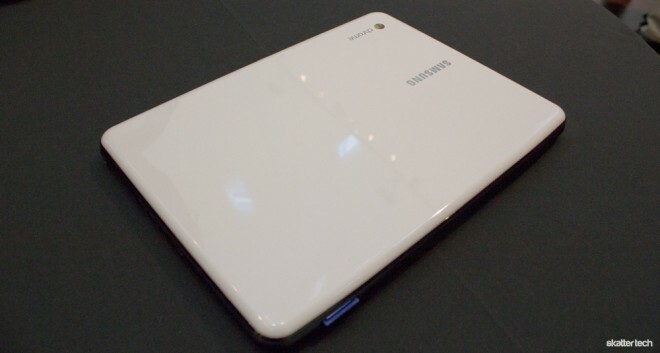 Samsung will make its Series 5 Chromebook available next month on June 15th through Amazon and Best Buy. The 3G model goes for $499 while the WiFi model is $429. For those wondering, Samsung will even offer two colors: silver and white. The Acer Chromebook will go live on Amazon on the same day too, but the company has only announced the $350 price tag for the WiFi only model. While most product launches are for the United States only, prospective buyers in the U.K., France, Germany, Netherlands, Italy, and Spain can also pick one up on June 15th too. Google is not just trying to revolutionize computing for consumers, education and business customers are in their line of fire too. These organizations can order Chromebooks for their employees or students without an up-front cost. Schools and universities only need to pay $20 a month per device while companies need to spend $28 a month per device. Opting for a 3G-enabled model for 100 MB mobile broadband will run both groups an additional $3 per month for each user. Business and education customers need to order at least 10 Chromebook units and sign a three-year commitment to take advantage of these subscription plans. Calculating the cost over the duration of the contract reveals a price tag of over $1,000 for a Samsung 3G Chromebook. It seems rather expensive considering the rather unimpressive hardware specifications and feature set, but there is something else worth considering: maintenance. Organizations spend fortunes on keeping technology up and running. Many are still running a generation or two old operating system too. Google ensures these machines are always running on the latest software and even goes far to claim performance will get better over time. These machines do not ship with bloat-ware since Chrome OS is just a browser, there is probably little-to-no concern regarding viruses, and encrypted data provides additional security. The IT team will not have to deal with getting users to backup regularly or have to recover data when devices are lost, stolen, or broken since everything is already in the cloud. Administrators can manage each of these devices from a web-based console and Google will offer technical support over the phone. Included warranty covers replacements and organizations are eligible for new hardware at the end of a three-year period. I had a chance to try a Samsung Chromebook for about a half hour following Google I/O at a small gathering held for a few journalists. Within a few minutes, I could tell that these laptops are designed for easy of use and simplicity. It does not feel overwhelming as a traditional computer might to many consumers who are not too tech savvy. According to a representative form Google, getting the entire machine setup after unpacking takes just 3 minutes. I tested resuming the device from standby and it turned on in less than a second after open the display. The build quality does not strike of expensive parts, but it does not feel fragile in any way either. 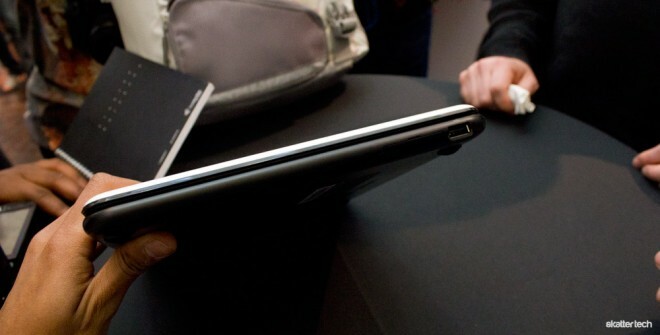 The device weighs just 3.3 pounds which is fairly light and is just .79 inches thick. The dual-core processor handled playing 720p YouTube flash videos seamlessly despite lacking an internal GPU. A new media player lets users playback multimedia from a flash drive or a memory card too. The touch pad was very responsive and two-finger scrolling gestures work smoothly. I found that typing on the chiclet keyboard comfortable with enough for both hands and perfect amount of ‘click.’ The display was rather sharp and bright compared to other notebooks. I did not have a chance to try the web cam, but it apparently features a 1.3 megapixel sensor with full support for Google Talk. The traditional function key row now have dedicated buttons for back/forward browsing, page refresh, full screen, brightness controls, and volume adjustments. Google even did away with the Caps Lock button in exchange for a search key which opens a new tab. Google’s introduction of the Chromebook is a major change for the market, but it also brings a few concerns when it comes to available features and the price point. From a consumer perspective, one could buy a netbook for less and use the Chrome browser for the same experience plus more. If companies can handle technical support for employees on their own at a better price, they might as well purchase hardware without contracts. Other concerns were the issue of getting work done without a network connection even though these devices come with 3G mobile broadband and WiFi. Thankfully core apps such as Gmail, Docs, and Calendar are getting native HTML5 offline support and other third-party apps will probably follow the lead. We even heard that Dropbox integration was in the works and services such as Box.net are already available. It is still too early to tell how this new subscription based model will play out, but it looks like it could work for many. While developers and engineers still need full-fledged machines, it could be a perfect match for companies which just need a web portal to get work done.